So by now, you’ve probably heard of surface plasmon resonance (SPR). SPR is a label-free technology which allows researchers to quantitatively analyze binding between two biomolecules. SPR technology allows us to determine the kon, koff and KD of interactions, providing deeper insight into binding events compared to other techniques that only give endpoint measurements, such as pull-down assays. SPR typically consists of sensors made out of thin films of gold which are key for this label-free technique. Most researchers don’t have access to this technology due to the complexity and cost of the instrument. 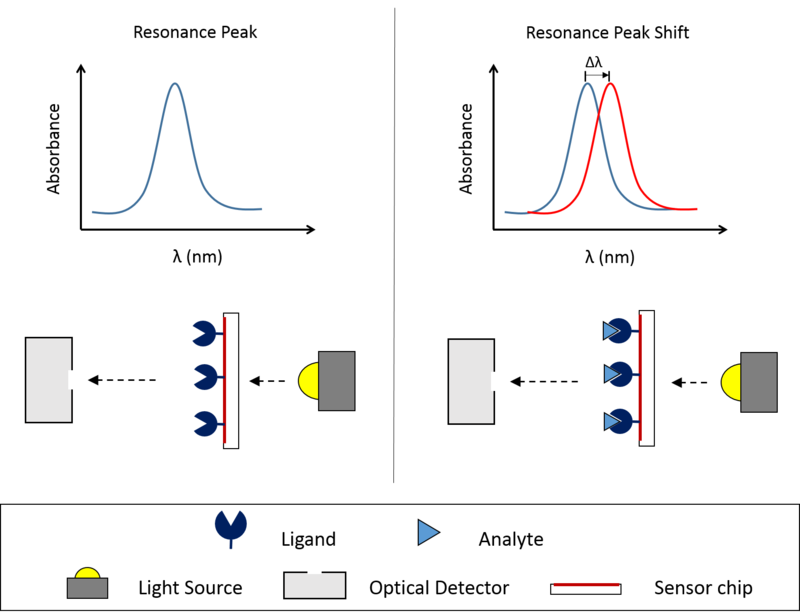 Localized surface plasmon resonance (LSPR) has been studied for many years and is an alternative technique to SPR but it is more accessible and affordable, which is why we based our OpenSPR instrument on LSPR. Since LSPR is a relatively new technology, there are a few questions we hear often from researchers. We summarized them for you below, so you can be an LSPR expert too! 1. What is LSPR and how is it different from traditional SPR? LSPR is generated by metal nanoparticles, typically gold and silver, as compared to a continuous film of gold as used in traditional SPR. LSPR produces a strong resonance absorbance peak in the visible range of light, with its position being highly sensitive to the local refractive index surrounding the particle. Therefore, OpenSPR measures small changes in the wavelength of the absorbance position, rather than the angle as in traditional SPR. Both SPR and LSPR operate by using incident light to collectively excite electrons of a conduction band in a metal. The result is a coherent localized plasmon oscillation. The resonant frequency strongly depends on the composition, size, geometry, dielectric environment, and separation distance of the conductive band, as shown in the figure below. In both techniques, response is measured in real-time and results in a binding curve. Various concentrations of analyte are used to get a few binding curves which are fit to a binding model to determine kinetic binding constants such as the kon, koff and KD. 2. What are the benefits of LSPR? 3. How does sensitivity compare to traditional SPR? You might notice that SPR sensors have a much higher refractive index sensitivity (m or RIS) than LSPR sensors, but their sensitivity towards binding events is similar. This is because nanoparticles have a much shorter electromagnetic decay length (ld) compared to gold films, which confines the response to a smaller sensing volume. Because LSPR has a more compact sensing volume, it is more sensitive to molecular binding and less sensitive to bulk effects, which means less interference from bulk signals. Sensitivity for LSPR is 6 RU/pg/mm2, which is better than the sensitivity of standard SPR instruments (1 RU/pg/mm2). Artifacts caused by external variables such as temperature drift or buffer refractive index changes are also reduced. The smaller decay length of SPR versus LSPR is illustrated in the image below. 4. What is the signal output in LSPR? You might notice that LSPR measures the change in wavelength shift in real-time, typically in picometers (pm), rather than the response units (RU) as commonly seen in SPR measurements. RU is an abstract unit that has no clear physical meaning. In traditional SPR, RU is proportional to the change in the reflected light angle caused by a change in the refractive index. Since LSPR allows us to measure small changes in the wavelength of the absorbance position, rather than an angle change, the output unit is in pm (or nm). Regardless of the output, response is measured in real-time and results in a binding curve in both techniques. de Feijter, J. A., J. Benjamins, and F. A. Veer. 1978. Ellipsometry as a tool to study the ad-sorption of synthetic and biopolymers at the air-water interface. Biopolymers. 17:1759–1772.